What is CMx Contract Experience? CMx Contract Experience is a robust, feature-rich contract automation and life cycle management solution built to provide businesses with best-of-the-breed implementation and innovative functionalities, enabling them to centralize all their workflows and streamline their contract management-related processes so you can focus on other things that require your attention. The software is not only meant to centralize contract storage, but also enhance your compliance and significantly reduce legal risks that comes with handling, creating, and dealing with contracts. Available as an online or on-premise solution, CMx Contract Experience provides users with a system that is simple and quick to configure and manage. Powerful features such central contract repository, built-in CRM, contract review and approval workflow speeds things up while increasing your efficiency and compliance. CMx Contract Management Experience delivers a comprehensive Contract Lifecycle Management (CLM) Software designed to help you effectively and efficiently address your contract management needs and requirements. Plus, you can choose have it installed on the cloud or right on your servers. CMx Contract Management Experience is highly scalable, allowing you to scale the system based on your business specifications and rate of growth. The software comes with a very secure central contract repository where you can store all your contracts from all your departments. You have total control over who can access what, ensuring that all your contracts and all information detailed in each document do not fall into unauthorized parties and individuals. A powerful search engine integrated into the repository allows you to retrieve all the documents you need in milliseconds via highly efficient indexing. Creating contract drafts is easy, thanks to the software’s capability to drag and dropped approved clauses within Microsoft Word. It is effortless to maintain all versions and this results in better team productivity and compliance. CMx Contract Management helps you manage your contracts in a breeze. The software lets you review contracts and approve workflows from a single location. Security is a paramount concern, which is why CMx Contract Management Experience implements tight security measures such as Multi-Factor/Two Step Authentication (MFA), World class Secured SSL Certificate, and Encrypted data storage among other to keep your data safe and protected always. Need to monitor contracts and their trails? CMx Contract Management experience provides you with contract analytics, reports, and extensive activity logs to help you keep track of all your contracts. What Problems Will CMx Contract Experience Solve? Companies often start with contract management using folders , spreadsheets and google drive before actually realizing the need for a contract management solution. CMx helps customers eliminate the legal risks involved with not renewing critical contracts on time by providing timely alerts and a repository which is very easy to search with. CMx by default provides drafting and redlining abilities using which customers legal team can quickly draft contract documents which can be redlined against the central contract repository. CMx provides in-built native electronic signature capability with no additional charge to the customer. If you are interested in CMx Contract Experience it might also be beneficial to check out other subcategories of Best Contract Lifecycle Management Software gathered in our base of SaaS software reviews. Every enterprise has its own characteristics, and might require a specific Contract Lifecycle Management Software solution that will be designed for their business size, type of customers and staff and even particular niche they deal with. We advise you don't count on finding an ideal solution that will be suitable for each company no matter what their background is. It may be a good idea to read a few CMx Contract Experience reviews first and even then you should keep in mind what the service is supposed to do for your business and your employees. Do you require an easy and straightforward solution with just essential features? Will you really use the complex tools needed by experts and big enterprises? Are there any specific tools that are especially practical for the industry you work in? If you ask yourself these questions it is going to be much easier to find a reliable solution that will fit your budget. How Much Does CMx Contract Experience Cost? We realize that when you make a decision to buy Contract Lifecycle Management Software it’s important not only to see how experts evaluate it in their reviews, but also to find out if the real people and companies that buy it are actually satisfied with the product. That’s why we’ve created our behavior-based Customer Satisfaction Algorithm™ that gathers customer reviews, comments and CMx Contract Experience reviews across a wide range of social media sites. The data is then presented in an easy to digest form showing how many people had positive and negative experience with CMx Contract Experience. With that information at hand you should be equipped to make an informed buying decision that you won’t regret. 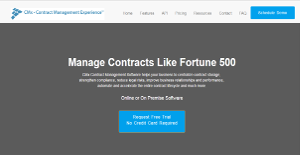 What are CMx Contract Experience pricing details? What integrations are available for CMx Contract Experience? CMx Contract Experience offers connectors for all ERP’s and CRM systems and many more in the road map. If you need more information about CMx Contract Experience or you simply have a question let us know what you need and we’ll forward your request directly to the vendor.